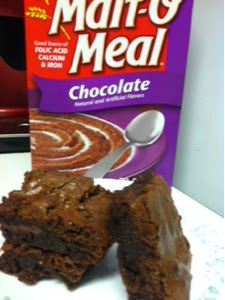 Anyone who have bought a box of Chocolate Malt-O-Meal has seen the Fudgy Chocolate Chip Brownie recipe on the box. I was not impressed on how these brownies turned out when I first made them many years ago. To be fair, at the time I made them without the chocolate chips. This time around I substituted the baking chocolate with 1/3 cup of baking cocoa, because it is what I had on hand. I almost always have baking cocoa on hand, and rarely have the bars of baking chocolate. This time, I am happy with the results. For some reason my brownies did not turn out all that fudgy the first time I made them years ago, this time I was not disappointed. They turned out as delicious as any other fudge brownie recipe. This recipe is found on the box, or here at Malt-O-Meal's web site. I love Malt O Meal but never considered it with brownies, sounds good, I will have to try it. Hope you are having a great week and thanks so much for sharing your awesome talent with Full Plate Thursday.